Ribs, sausage, brisket and you name it! 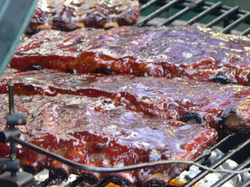 We specialize in BBQ ribs, brisket, roast, chicken, sausage/links and more. Whether your event includes small or large groups, we customize a package to suit your needs. ﻿﻿﻿﻿﻿﻿﻿﻿© 1988-2019. All Rights Reserved. La Raye's Bar-B-Que Sauce, Inc.